From our Classic Bamboo Collection- Natural textures are immediately welcoming. 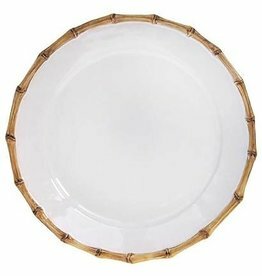 Our bamboo trim exudes casual elegance that lends a dash of international flair to the table and mixes easily with other collections. From our Classic Bamboo Collection- Drink deeply from this fetching mug before whisking off to the airport to catch a plane for Dubai. 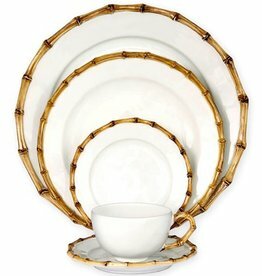 We love the bamboo on its own, and mixed and matched with Colette glass plates, Country Estate Delft and more. Featured tableware of the Ocala Culinary Festival 2018. All pieces available open stock. 4 piece add on set also available. All pieces available open stock. 5 piece placesetting also available. 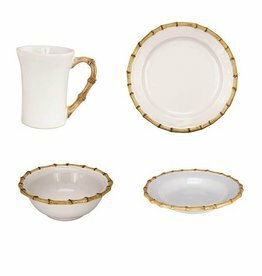 From our Classic Bamboo Collection- This companion plate adds an extra lovely layer to table settings. Our classic bamboo rim pays homage to tradition while a salad served with edible petals adds a modern twist. From our Classic Bamboo Collection - A bamboo handle evokes the centuries-old tradition of tea from the Orient. Sip English Breakfast, White Jasmine, or coffee while romantically dreaming of the Silk Road. Our favorite Juliska bowl in every pattern is the pasta/soup bowl. Perfect for soups, salads, and stews as well as serving. You’ll find yourself eating from this bowl every day. 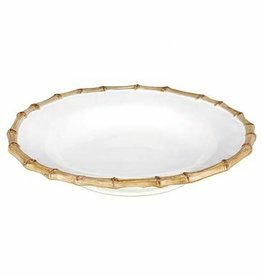 From our Classic Bamboo Collection- swirl some fresh berries and yogurt in this chic perfectly sized bowl. Our ceramic stoneware is made in Portugal and is oven, microwave, dishwasher and freezer safe.